Tudor Heritage Black Bay 79230N. Tudor Heritage Black Bay 79230N. 41mm steel case which is water resistant to 200 metres. 28,800vph. 70 hour power reserve. Automatic MT5602 movement. Black dial with luminous hour markers and, "Snowflake" hands. Uni-directional black bezel. Steel bracelet with folding clasp and safety catch. Box and papers dated October 2016. SKU: 3050073. 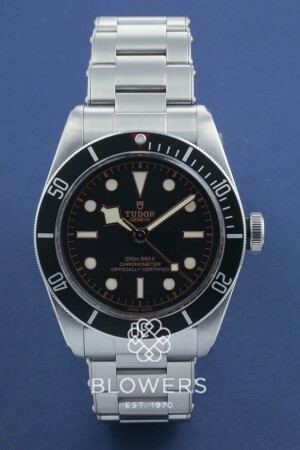 Categories: Black Bay, Tudor.